Our Multi-Media Docent Presentation fits neatly into one 45-minute class period. It meets 3rd grade TEKS for fine arts, language arts, math, science, and social studies, and includes fun elements such as: video excerpts, simple dance activities, real pointe shoes and ballet slippers, actual costumes from past productions, and a Q&A session during which your students can have all of their questions answered. The Docent Program is offered only to those schools attending The Nutcracker School Shows as the pre-performance educational component to those shows. 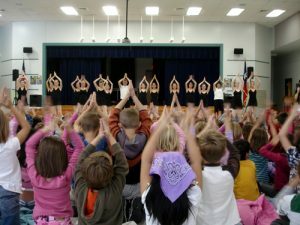 Ballet Austin, its Guild, and volunteers have been providing this free in-school educational program for students throughout Central Texas for more than 25 years. The Docent Program will help make a field trip to the ballet a meaningful and enjoyable educational experience for Central Texas students and educators. Availability of Docent Presentations is limited and all requests should be submitted in conjunction with your school’s The Nutcracker School Shows registration. Docent presentations are available starting the second week of November and running through the School Shows performance dates. Timing request are submitted by the schools in conjunction with your school’s The Nutcracker School Shows registration. Scheduling is coordinated directly between the teacher and volunteer Docent in the weeks leading up to The Nutcracker School Shows. Schools must reserve a minimum of 45 minutes for a Docent Presentation. Teachers must be present in the classroom during the Docent Presentation in order to help with equipment and maintain discipline. Teachers are responsible for insuring that the classroom and equipment are ready for the Docent Presentation prior to the arrival of the Docent. Docent requests are accepted for Central Texas schools within a 30-minute drive of Austin city limits. 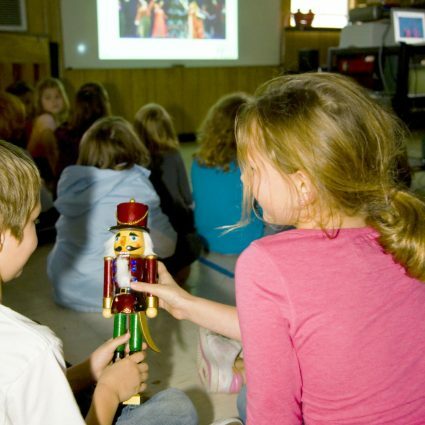 Docent presentations are provided at no cost to schools that have registered for The Nutcracker School Shows in that same school year.